Lots of grocery stores and every butcher I’ve ever asked carries pork belly. Chains such as Costco, Sams Club are a good bet. Keep in mind when ordering you don’t need any fancy pork belly like kurobuta or berkshire. In my experience pork belly usually ranges from $3.00 – $7.00 per pound. When you see kurobuta or berkshire you’ll generally see them costing 2-3x this much. Nope. Skin on or off, both work great. If you have skin on just slice it off after you cook the belly and before you slice it. Is pork belly just slab bacon before it is smoked/cured? Heat the water with Tender Quick, sugar and all the other spices. Cook over medium heat, stirring constantly, until the sugar and Tender quick are dissolved. Remove from heat add ice. Stir until the ice has melted. Score the front and back (fat side) of the pork belly with a sharp knife ¼ inch deep. Place pork belly in either catering pan or sealed container and cover with brine, put in the refrigerator. Each day either turn or massage to make sure the pork belly is covered by the brine. On the final day remove brine and add clean cold water and soak overnight in the refrigerator to remove some of the salt. Fire up the Good-One Smoker to 250 degrees using All-Natural lump charcoal. Rub the Pork belly down with a heavy coat of Three Little Pig’s Touch of Cherry Rub to create the crust. 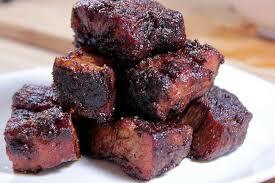 Place the pork belly on the smoker and add your favorite smoking wood, I used wild cherry for this cook. Smoke the pork belly to 200 degrees internal, usually about 6-7 hours at 250 degrees. Once the Pork Belly had been removed from the smoker allow to cool for ½ hour. Cut against the grain in about 1 inch slices, then cut the slices into the desired cube size to fit your need. Place the cubes in a hot skillet and add a little butter and Three Little Pig’s Competition BBQ Sauce and sauté until hot. Serve on a large piece of Texas Toast with a side of slaw and beans. 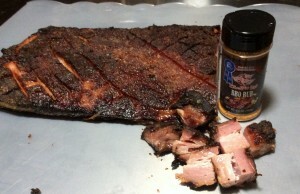 This entry was posted in BBQ Classes, BBQ Tips, Recipes, Side Dishes and tagged 3 little pigs, bar b que, barbecue rubs, barbecue sauces, bbq grilling, bbq rub, BBQ Rubs, belly, Best BBQ rub, Best bbq rubs, Best BBQ Sauce, burnt ends, Champ Rubs, Champ Sauces, Chris Marks BBQ, dry ribs, dry rubs for meat, Good One Smokers, great bbq rubs, grill barbecue, grill sauces, grilling, grilling sauce, meat rubs and sauces, pork belly, rubs for grilling, smoke rub, smoked barbecue, Three Little Pigs Touch of Cherry Rub, World Champion BBQ. Bookmark the permalink. nom, Nom, NOM. That is all.